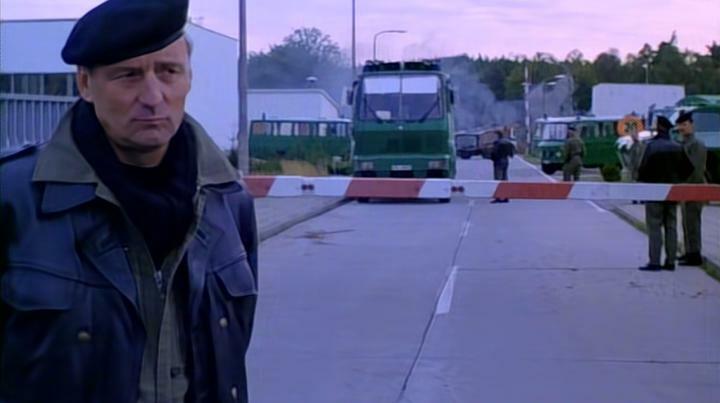 IMCDb.org: Mercedes-Benz 2628 WaWe 9000 [NG] in "Den demokratiske terroristen, 1992"
I think your first idea was quite right. The boxy elements on the roof are loudspeakers, the water cannons are retracted and hence not visible. I guess the same vehicle is visible from the side in this picture: /vehicle_207685-Mercedes-Benz-G-Klasse-W460.html . WaWe = Wasserwerfer ? Could be the same one indeed. WaWe stands for Wasserwerfer, as you said, and 9000 litres is the water capacity. NG, older than 1980: no windflaps on the corners.